Lock in a great price for Augusta Spa Resort 4* Superior - rated 8.7 by recent guests. Amazing pool area. Ideal for adults and children. Fabulous breakfast spread. Excellent facilities. The staff are excellent, friendly and accommodating. Emphasis on guest relaxation. Loved the Galician food. The hammocks on the balconies are a nice touch too. La habitación que nos tocó desta vez en la tercera planta era impresionante con todas mas letras. Me gusta mucho el detalle del masaje dentro de la media pensión con acceso al spa. Y el jacuzzi exterior es un puntazo. Pequeno almoço muito bom, em qualidade e em quantidade. Boa localização, com óptimas vistas (mesmo vistas de mar), embora um pouco distante da marginal (algumas centenas de metros) com ruas acidentadas. Sus instalaciones son muy buena, sin duda merece la pena ir, y repetiremos seguro! No hay ningún problema a la hora de consumir productos sin gluten, eso es algo que no siempre te lo garantizan, cosa que aquí no hubo problema. 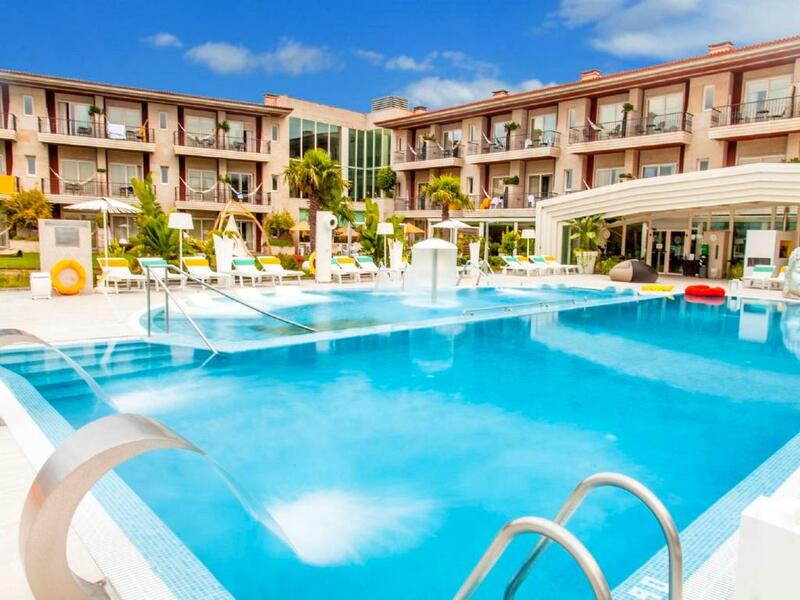 Located 650 yards from Silgar Beach in Sanxenxo, this resort has 2 different buildings, and offers elegant rooms with free WiFi and views of the Pontevedra River. It features an extensive spa and an outdoor pool. The spa includes 3 heated pools, one of which is adults-only. It also features hot tubs, saunas and a Turkish bath. It offers massage and beauty treatments, including manicures and pedicures. Rooms at the Augusta come with flat-screen satellite TV and a DVD player. There is a large terrace and a living room. Free bottles of water can be found in the minibar, and there is parking in the building. The property also includes a children's playground. The hotel’s Via Augusta restaurant serves Galician cuisine, such as fish specials, stews and paella. Via Nuvo offers international options, with seafood and vegetables. Augusta Spa Resort is situated 250 yards from the centre of Sanxenxo and 650 yards from the Congress Centre. Augusta Spa Resort 4* Superior has been welcoming Booking.com guests since 15 Sept 2010. When would you like to stay at Augusta Spa Resort 4* Superior? -Stay in Double Room with breakfast. 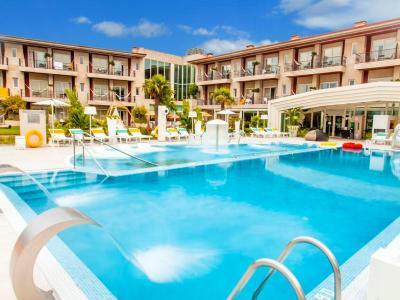 -Unlimited access to all the heated swimming pools and thermal circuit with multiple types of baths and access to the fitness centre. Children of 3 to 12 years pay a fixed supplement of EUR 29.90 per day (VAT included). A 3rd adult pays 80% of the normal adult rate. Public parking is possible on site (reservation is not needed) and costs EUR 7.70 per day. This spacious suite can accommodate 4 people. It includes a kitchen, whirlpool bath, and lounge area with a TV and double sofa bed. -Stay in Family Suite with breakfast. Please note that the child's supplement is 25% of the daily rate. Please note that the half-board rate does not include drinks. This large suite comes with a well equipped kitchen and a lounge area including a double sofa bed and a TV. The private bathroom has a whirlpool bath. It includes unlimited access to the spa. Featuring free access to the spa, this spacious suite has a living room with a flat-screen TV. The bathroom comes with free toiletries, spa bath, slippers, and bathrobe. Featuring a terrace with sea views, this suite includes a flat-screen TV and minibar. The bathroom comes with free toiletries, bath, slippers, and bathrobe. Featuring sea views, this suite includes a flat-screen TV and minibar. The bathroom comes with free toiletries, bath, slippers, and bathrobe. House rules Augusta Spa Resort 4* Superior takes special requests - add in the next step! Augusta Spa Resort 4* Superior accepts these cards and reserves the right to temporarily hold an amount prior to arrival. Please note that the spa has an extra cost of EUR 22 per person per day. Children may access the designated areas in the spa when the room rate includes spa access. Food was not great and expensive given options. The games room was not ideal. The playstations never worked & had to pay for fusball table & dart board (given price of hotel this should be free). Otherwise nice facilities & staff. Everything perfect. Extremely family friendly. It is located up a fairly steep hill. As it is 45 mins from Vigo airport a car is required. However, the hotel is able to organise rental cars to be delivered to the hotel too. If you intend to explore the area (and you should) a car is essential.